UFC Fight Night 146 is happening tonight (Sat., March 9, 2019) from inside Intrust Bank Arena in Wichita, Kansas. In the main headliner, a hard hitter Derrick Lewis clashes against former champion Junior dos Santo in a heavyweight slugfest. Lewis last fought at November’s UFC 230 PPV event where Daniel Cormier made quick work of “Black Beast.” Meanwhile, dos Santos riding on two fights winning streak over the likes of Blagoy Ivanov and Tai Tuivasa. 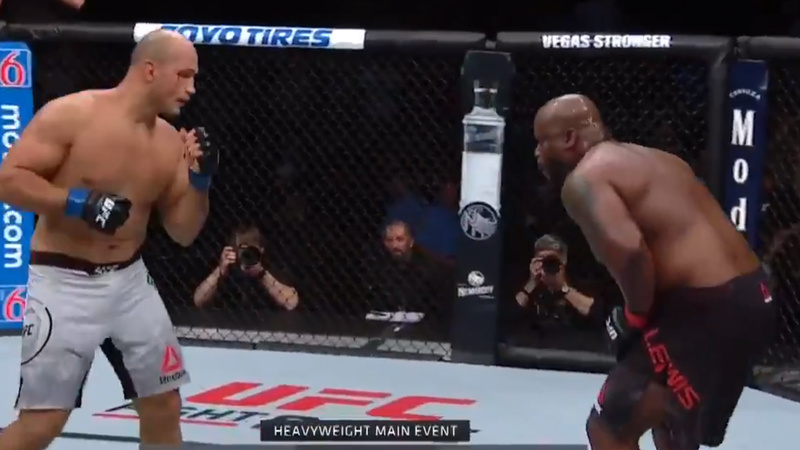 Derrick Lewis opened up the fight with a heavy leg kick. An inadvertent eye poke from dos Santos led a brief pause in a contest to check on the matter. The match resumed again, Lewis attempted a kick and flying knee. Dos Santos tried to avoid in return absorbs a massive right hand followed by a haymaker from Lewis. Dos Santos wobbled Lewis with a spinning kick. Then, Lewis blasted a former champion with a massive right hand. JDS after eating a short continues to attack hobbled Lewis. Derrick hung tight and made it to the second round. By the second frame, Lewis tries a head kick, but JDS blocks it. Dos Santos slips in the process and scrambles away from Lewis’ onslaught. Afterward, JDS continue to attack Lewis forcing the referee to wave off the action. JDS has now won three fights in a row.